Small-cap stocks, which have market caps between $300 million and $2 billion, belong in growth-oriented portfolios, since they have more room to run than larger companies. However, small-cap stocks are also generally riskier because the companies haven't yet endured the growing pains of larger companies. Today, three Motley Fool contributors will highlight a trio of small-cap stocks that deserve your attention: Huami (NYSE:HMI), Tanger Factory Outlets (NYSE:SKT), and Editas Medicine (NASDAQ:EDIT). Leo Sun (Huami): Huami is the Chinese company that produces Xiaomi's (NASDAQOTH:XIACF) fitness trackers, which controlled 13.5% of the global wearables market in 2018, according to IDC. That put it in second place behind Apple (NASDAQ:AAPL), which controlled 26.8% of the market. Former market leader Fitbit (NYSE:FIT) ranked third with an 8% share. Huami also sells its own Amazfit wearables, which are sold at Xiaomi's stores. Huami is more profitable than Fitbit because Xiaomi shoulders all the design, manufacturing, distribution, and marketing expenses for its Xiaomi-branded products. Furthermore, Xiaomi owns about a fifth of Huami, and Xiaomi CEO Lei Jun personally owns another fifth of the company. This symbiotic relationship is controversial, and the critics claim that Huami is just a publicly traded subsidiary of Xiaomi. However, it's gradually pivoting away from Xiaomi by producing more Amazfit devices, signing partnerships with Timex and PAI Health to expand its own ecosystem, and producing new first-party hardware -- like its Huangshan-1 AI chip for healthcare-oriented wearables. Huami's revenue and adjusted net income rose 78% and 106%, respectively, in 2018. Its full-year gross margin expanded from 24.1% to 25.8%, and its total shipments climbed 52% to 27.5 million. Fitbit's shipments, by comparison, fell 9% to 13.9 million last year. Huami didn't provide full-year guidance for 2019, but analysts expect its revenue and earnings to rise 34% and 16%, respectively, in U.S. dollar terms this year. Those are solid growth rates for a small-cap stock that trades at just nine times forward earnings. Reuben Gregg Brewer (Tanger Factory Outlet Centers, Inc.): These are troubling times in retail real estate, with consumer habits shifting because of increasing use of the internet. The so-called "retail apocalypse" is real, though likely overhyped. Retail properties, specifically malls, in poor locations are suffering. 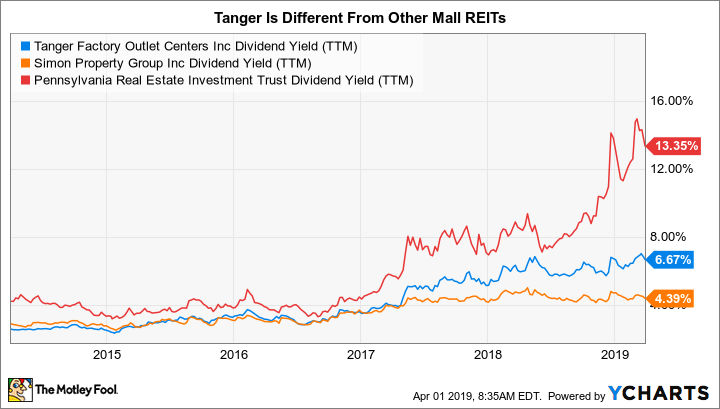 It's a good thing for $2 billion market Tanger, the only pure-play factory outlet center real estate investment trust (REIT), that it stands out from the pack. For starters, Tanger doesn't own enclosed malls, which are expensive to operate. And it doesn't have struggling anchor tenants leaving gaping holes in its properties. That said, store closures are an issue, with occupancy expected to fall from 96.8% at the end of 2018 to as low as 94% in 2019. But the vacated space is smaller and easier to upgrade. Add in lessee costs that are generally lower as well, and the battle Tanger faces to fill space isn't as big a deal as the one facing lower-tier enclosed malls. But investors don't appear to care about these important differences based on Tanger's historically high 6.7% yield. SKT Dividend Yield (TTM) data by YCharts. The thing is, Tanger has an investment-grade balance sheet. Debt makes up just 50% of adjusted total assets (recent property sales will likely improve that number). It covered interest expenses by a strong 5.2 times last year. And the dividend only ate up around 55% of funds from operations in 2018, providing ample protection for the current payout and even room for dividend growth, stock buybacks, and investing in its 40 outlet centers to keep them fresh for customers and new tenants. Sure, Tanger is working through tough times, but it's well positioned to deal with the headwinds. And investors looking for a small, misunderstood dividend-paying stock should step back from the headlines and take a closer look today. Steve Symington (Editas Medicine): Shares of Editas Medicine may have popped nearly 19% last month on the heels of the company's fourth-quarter 2018 results, but they're still down more than 20% over the past year through no real fault of the gene-editing specialist. As it stands, we're still set to enjoy enviable growth from this relatively small company given its $1.3 billion market cap as of this writing. In the near term, much of that growth will depend on the success of Editas' primary EDIT-101 drug candidate -- designed to treat Leber Congenital Amaurosis type 10 (LCA10), the leading cause of childhood blindness -- for which the Food and Drug Administration approved the company's investigational new drug (IND) application just last quarter. EDIT-101 is now poised to enter a phase 1/2 dose-escalation study in the second half this year, which would make it the first in vivo, or editing inside the body, CRISPR medicine ever administered to patients. If one or all of these medicines ultimately achieves mainstream adoption, let it suffice to say Editas won't remain a small-cap stock for long.